Shanghai Sindo Panel Company Ltd., established in China in 2002, is a wood-based products manufacturer, dedicated to providing high quality products at competitive prices. At Sindo, we specialize in the production of wood-based products for the construction and furniture industries. Due to our continuous efforts and years of experience, we have created our own brands, namely: "Sindoply", "Sindoplx", "Swan", "Falcon", and "Spark". We offer a comprehensive range of products in a variety of types and sizes that are not generally available from other suppliers. Our company’s sales have reached 50 million USD. Sindo is located in Shanghai, the largest commercial city in China, and we are close to PuDong International Port. 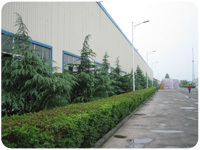 Our factories are located in North JiangSu and South ShanDong Provinces. This location offers an abundance of poplar logs, the primary raw material used in the construction of our products. This locale not only offers us access to an abundance of raw materials, but it also provides easy access to convenient transportation of our wood-based products. This enables us to quickly, conveniently, and cost-effectively transport our finished products to our clients. Our high quality wood-based products are exported to places all over the world, including the Middle East, the United States, Germany, Egypt, Japan, Korea, Canada, Mexico, Argentina, Brazil, Peru, and more. Within the plywood category, we offer plywood, door plywood, decorative plywood, polyester plywood, HPL plywood, and LVL plywood, primarily used in furniture, planes, ships, trains, automobiles, and buildings. In the film faced plywood category, we can provide brown film faced plywood, black film faced plywood, and imprinted film faced plywood. These plywood products are primarily used for formwork and indispensable building materials in the construction industry. In our MDF and HDF category, we offer MDF board, HDF board, melamine MDF, and veneer fancy MDF. These engineered wood products are used in the manufacturing of flooring, door panels, partitions, and furniture. Our hardboard section contains such products as hardboard, embossed hardboard, melamine hardboard, and drilled hardboard. These flexible and strong products are used in the furniture, construction, and packaging industries. Within the blockboard section, we offer plain blockboard, polyester blockboard, and decorative blockboard. These products are ideal for room decoration and high-grade furniture, and are used to make windows, doors, partitions, and artificial walls. Our gypsum board is largely used for ceilings, partitions, and interior walls. At Sindo, quality control is an essential component in the manufacturing of our wood-based products. One way we accomplish this is by establishing close relationships with our trusted raw material suppliers. In doing this, we are able to acquire high quality raw materials at low prices, and we pass this savings on to our customers. In addition, we ensure product quality by employing a highly trained and experienced inspection staff. Using internationally advanced testing instruments, such as our moisture tester and electronic vernier caliper, we strictly inspect each product at different phases of the production process, from raw material acquisition, to processing, to the final delivery to our clients. Our attention to quality and detail are why our wood-based products are CE and SONCAP certified. Our steady growth over the last 10 years is due to the fact that we provide superior products and excellent service to our customers. By focusing on our clients’ requirements and listening to their needs, we hope to continue this growth in the years ahead. With our years of experience, we have terrific annual production capabilities. 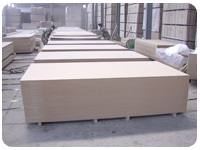 Thus, our annual production for our MDF is 200, 000M3; our plywood is 150, 000M3, and our fiberboard is 100, 000M3. This provides us with a large inventory that enables us to quickly deliver our products to our worldwide customers. In addition, we can cut any board to our clients’ particular size specifications. We do our best to match any shape or design needed. OEM service is also provided upon request. In addition, defective products can be returned and replaced upon request. With high quality products and attentive customer service, our clients can feel secure in purchasing their wood-based products from Sindo.